Summer is a time for escape reading. But that designation need not be limited to fiction; books written for the general reader on topics outside one's area of expertise can also provide passage to exciting new places. This month's bookshelf includes six non-fiction titles, five novels and one collection of short stories. The last three titles are now in paperback, suitable for a vacation or some beach time. Good reading to you! 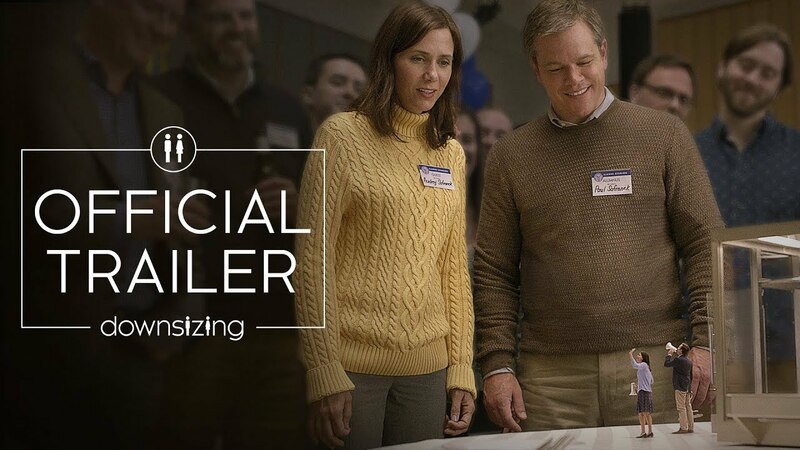 There are several reasons climate communicators and activists, and not just cli-fi aficionados, could benefit by seeing Downsizing, the end-of-2017 movie starring Matt Damon and directed by Alexander Payne—to be released March 20 on disk. 1. It is one of the few films that addresses climate change mitigation (i.e. reducing greenhouse gas emissions). Most cli-fi movies depict extreme weather disasters (impacts) or survivors struggling in bleak climate-changed landscapes (adaptation). Typically one of the coldest months of the year, February seems a good time to present a selection of books that explore how climate change is affecting the coldest regions of the world. Eleven of the 13 titles presented below were (re)published between 2000 and 2017; two are slated for release later this month. The last four are collections of photographs by internationally recognized photographers James Balog and Sebastian Copeland. When Kelsey Singer, a student at Cedar Ridge High School in Round Rock, Texas, learned about a book her teacher had received in the mail—Why Scientists Disagree About Global Warming—she was perplexed and intrigued. Just who was responsible for what she considered to be a misinformation campaign? When climate denial and "alternative facts" pervade the body politic, it's time to zoom in on the science. Climate change is real and its effects are already visible—even more so when you can see them play out on the big screen. The 15th Wild and Scenic Film Festival, in Nevada City in January, was rife with such evidence. Unlike most film festivals put on by big production companies, this one is produced by a nonprofit environmental organization called South Yuba River Citizens League—and powered by 700 of its volunteers. The organizers' passion is clear and so is their intent: to inspire audiences to take action on the challenges facing our planet. With climate change at the top of that particular list and 120 films running over the course of a weekend, it's safe to say this reviewer faced no shortage of opportunity to sit back, relax and learn. From the gravely sobering, to the relentlessly hopeful, to the darkly comedic, this year's standout climate-related films showcased the range of feeling one might have about climate change. A few themes ran through each, however. Several pointed to a need for a complete transformation of the economic system, connecting the dots between energy, economy and environment. They also highlighted major momentum in the renewable energy sector. But most fundamentally, they went to the experts for the facts, then wove together compelling narratives to bring climate science—and action—to life. Following are four recommendations for provocative, intelligently made films that can make audiences think, feel and act. This harrowing yet dispassionate story opens with stark footage (like this) of soldiers scrambling out of trenches, some to, some away from the mushroom cloud rising in the distance—a fitting introduction for a film that suggests we are already perilously close to a new order of global disaster. From there, tension is sustained throughout, as some of our nation's highest ranking military and State and Defense Department leaders walk us through eight concrete ways in which climate change is emerging as a grave threat to national security. Graphically illustrating how years of unprecedented drought have contributed to the rise of radicalization in Syria, Afghanistan and Sudan, as well as catastrophes yet to come, such as sea-level rise and mass displacement in Bangladesh, the film lays bare the implications for global conflict. It also shows the vulnerabilities at home, from Katrina to Superstorm Sandy's crippling effects on New York City, to projections that the world's largest military base, in Norfolk, Virginia, is on track for frequent flooding as soon as 2040. The film traverses the world and the offices and libraries of major military leaders to show the cascading impacts of climate-related disasters like extreme weather, drought, sea-level rise and food shortage on other pressures … like poverty, conflict, capacity issues and migration, all together making existing vulnerabilities even more fraught. Throughout, we learn the many ways that leaders like former Secretaries of State Madeleine Albright and George Schultz and Marine Brigadier General Stephen Cheney have worked to call attention to the deep connection between security and climate change. And yet their warnings have often fallen on deaf ears, because some people still don't accept that climate change is happening. In what may be the film's most memorable comment, former army officer and artillery tank driver Michael Breen points out that if 99 percent of intelligence experts told him there was an ambush ahead, he would listen—he wouldn't say there was a 1 percent chance of no ambush. In this age of consequences, the film suggests, we cannot afford to ignore the vast majority of scientists' warnings. And yet, Breen later argues, we're not even engaging in the first line of defense. The story ends with a call to action. Just as the precise future of climate change impacts is unpredictable, so too is the human potential to rise to the challenge. Wrapping up with a veritable PSA for renewables and for programs that connect veterans with clean energy jobs, the film closes with the reminder that there is still time left to act. And time is the one resource we can't replenish. What now? Watch the trailer. Read The Tropic of Chaos, which outlines the convergence of poverty, violence and climate change; and or the Union of Concerned Scientists' report on sea rise and naval bases. Learn about the Solar Ready Vets project. Are You Ready to Drive on Solar Roadways? Anyone who's taken a road trip knows how intensely the sun can beat down on the roadway. Could all those rays be converted to solar power? Scott and Julie Brusaw said yes. This husband and wife team are the founders of Idaho-based company Solar Roadways. They created a system of solar panels coated with bulletproof glass that can replace pavement. It's not an unprecedented idea: both the Netherlands and France are researching solar roadways. But they have not yet been tried in the U.S. The Brusaws just installed their first pilot project in Sandpoint, Idaho. And they are working with the Missouri Department of Transportation on a project at a rest stop on Route 66. Brusaw: "We're hoping to be mass-manufacturing toward the end of next year and I expect to see them on residential roads probably in two to three years." Skeptics worry about the durability of the panels and also the expense of producing and maintaining them. But the Brusaws said the roads will pay for themselves over time by generating clean energy that can be delivered and sold to consumers. Roads hold tremendous potential as sources of clean power. For example, the Brusaws said if every road in the U.S. was made of solar panels, we could produce three times more energy than we use as a country. For the past century, coal has been king, providing the majority of U.S. energy for electricity generation. But a combination of new federal and state environmental policies and a glut of cheap natural gas (mostly from hydraulic fracturing or fracking) have led to a dramatic shift during the past decade, with coal dropping from 50 percent to 32 percent of our electricity generation and gas increasing from 18 percent to 33 percent. Just under a third of existing coal-based power generation in the U.S. has been shut down and the Obama administration has aggressively embraced the replacement of coal with gas as a key part of meeting its 2030 climate targets. We are quickly traveling down a gas bridge away from coal. But will this shift actually be a good thing for the climate? At first glance, replacing coal with natural gas seems like a good (though not great) step in combating climate change. Overall, carbon dioxide emissions from new gas power plants are as much as 66 percent lower than those of existing coal power plants. About half of this reduction is due to differing carbon intensities of the fuels (natural gas emits 40 percent less carbon than coal per unit of heat). The other half is due to the higher generation efficiency of natural gas (new natural gas plants convert heat to power at upwards of 50 percent efficiency, while typical coal plants only operate at about 33 percent efficiency). A way to reduce emissions by as much as two thirds while also saving money seems like a no-brainer for climate policy. But natural gas has an Achilles' heel that makes the question much harder to answer. Direct CO2 emissions from electricity generation in grams per kWh. Based on calculations from Hausfather 2015. Natural gas is predominately composed of methane. When methane is burned to produce electricity or heat, it releases carbon dioxide and water vapor. But not all natural gas produced is burned. Some of it is leaked at gas wells, in compressor stations, from pipelines or in storage. Methane is a powerful but short-lived greenhouse gas. While it is in the atmosphere, it is around 120 times more powerful than carbon dioxide per ton, but it quickly decomposes through chemical reactions and only about 20 percent of the methane emitted today will remain after 20 years. Carbon dioxide, on the other hand, has a much longer atmospheric lifetime. About half of the carbon dioxide emitted today will be around in 100 years (and virtually none of the methane will be) and about 15 percent of today's carbon dioxide will still be in the atmosphere in 10,000 years. This difference in longevity makes a comparison between the two tricky. Essentially, how much methane emissions today matter for the climate depends largely on the timeframe you are considering. If you care about avoiding warming later in the century (as the United Nations does with its 2C warming by 2100 target), there is relatively little problem with short-term methane emissions, as long as they are phased out in the next few decades. If you care about short-term changes, however, methane is a much bigger deal. How much methane leaks from the natural gas system is very much an open question. For a long time official U.S. Environmental Protection Agency (EPA) numbers suggested the emissions were small and falling fast, only amounting to around 1.5 percent of total production. But dozens of independent academics doing research using aircraft, satellite data and other instruments have consistently found higher emissions than officially reported. Adam Brandt at Stanford University published a high-profile paper in the journal Science in 2014 summarizing all the research to date. He found that overall emissions were likely between 25 and 75 percent higher than reported by EPA, suggesting that actual natural gas leakage rates are probably somewhere between 2 and 4 percent of gas production. (Some researchers have found leakage as high as 10 percent for individual fields, but there isn't evidence that those findings are characteristic of the sector as a whole). How Much Do Leaks Matter? What do these leakage rates mean for the viability of natural gas as a bridge fuel? Again, it comes down to a question of time frame. Let's look at a simple example of a big coal power plant. One option is to leave it alone for the next 30 years, at which point it will be replaced by renewable energy. Another option is to replace it with gas today and replace that gas with renewables in 30 years. The figure below shows the climate impacts over time (measured in units called radiative forcing) of existing coal (the dashed black line), new high-efficient coal plants (the solid black line) and new gas plants (the green line). The potential range of natural gas leakage is expressed by the gray envelope around the green line, with 1 percent leakage at the bottom and 6 percent leakage at the top (the green line itself shows a 3 percent leakage case). Adapted from Figure 3 of Hausfather 2015. If leakage is higher than 3 percent, there are some periods in the next 30 years when gas will result in more climate impact than new coal plants. If leakage is higher than 4 percent, there are some periods when gas will be worse for the climate than existing coal plants. But no matter what the leakage rate is, gas will still cut the climate impact by 50 percent in 2100 compared to new coal and 66 percent compared to existing coal. So whether switching from coal to gas is beneficial in this simple example depends on how you value near-term or longer-term warming. The importance of near-term warming is tough to assess. Climate models, by and large, don't predict any irreversible changes in periods as short as 30 years and potential tipping points in the climate generally depend more on the peak warming that occurs (which in nearly all foreseeable cases would occur after 2050). But there is much about the Earth's climate that is still unknown and scientists can't categorically rule out the potential for shorter-term warming to cause unforeseen impacts. With longer-term warming, the impacts are much more clear (and generally more dire). By the end of the century, we'd expect around 4C warming in a world where we didn't take any action to slow emissions. As the damages of climate change tend to increase exponentially with rising temperatures, many economists argue that the biggest impacts of climate change will occur later in the century and that the main focus should be on reducing longer-term warming. What About Choosing Neither Coal Nor Natural Gas? There is yet another wrinkle in the comparison of gas and coal. If they were the only two ways we could generate electricity, the analysis would be fairly straightforward. But there are many zero or near-zero carbon energy sources that are preferable to both coal and gas, including wind, solar and nuclear power. In a perfect world, we would skip the gas bridge entirely and immediately replace all the coal plants with renewables. The challenge is that although renewables are increasingly cost competitive with coal in some parts of the country, on average, they are still more expensive. Renewables are also often intermittent, producing less power when the sun doesn't shine or the wind doesn't blow and incurring additional expenses for energy storage technologies to help balance out the grid, at least once renewables reach a high enough percent of generation. On the other hand, renewables are getting cheaper and although it might not be practical to replace all coal plants with renewables immediately, it's definitely possible to do so in the next decade if renewables continue to fall in price. If we replace coal with gas today, we've sunk costs into new gas infrastructure that we might be loath to replace a few years later with renewables. In this way, a gas bridge could delay the widespread adoption of renewables. It comes down to this: If we think that coal plants would stick around for 15 years or more in the absence of gas, its probably better to replace them with gas today. If we think we will have the political will to retire gas plants early, we could also potentially benefit from a gas bridge. But if we end up locking in gas infrastructure that sticks around and delays renewables, we might be better off eschewing a gas bridge even if it means sticking around with coal a bit longer. It's a tough problem with no simple answers, but the one thing we know for sure is that if natural gas is to serve as a bridge away from coal, it had better be a short one. A musician wants to get the facts right as he raps on climate change "chaos." Brinkman [rap]: "Hollywood summer blockbusters can't touch this. I get my thrills from the latest reports published by the Intergovernmental Panel on Climate Change formed in 1988 to get the science straight." That's "Baba" Brinkman, who wrote and performed the off-broadway show, Rap Guide to Climate Chaos. Next, he's releasing a CD with songs from the show. Brinkman: "And my hope is that the hooks on these songs are ear-worms that people can't get out of their head and it reminds them to think about and be concerned about climate change even when they think they're just reciting catchy lyrics." Brinkman is committed to both entertainment and accuracy. He's known as "the peer-reviewed rapper." Brinkman: "I've recruited sort of advisory boards of academics who will listen to the lyrics of the songs or read the script in advance and make sure that I haven't misconstrued anything." Brinkman [rap]: "It says the world is getting warmer, unequivocally. And the oceans have increased thirty percent in acidity and 90 percent of the warming trend is oceanic and concentrated in the Arctic—nobody panic." Brinkman hopes his rap helps people understand that climate change is solvable. Brinkman [rap]: "Climate change communicators keep it positive. People need to feel like they still have options and we do have options." Reporting credit: Analeah Rosen / ChavoBart Digital Media. Audio lyric segments in this broadcast are used with permission by Baba Brinkman. At times, marine biologist Ruth Gates is appalled by the path her research has taken. "It's horrifying," she said recently, sitting in a spartan office at the Hawaii Institute of Marine Science. Gates, the institute's director, manages a far-reaching research program to develop novel techniques to prevent climate change from harming the world's coral. Gates is modifying these wild organisms to thrive in the warmer and more-acidic ocean of the future, rather than trying to protect them by safeguarding their habitats and controlling harvesting. In doing so, she's moving far beyond the boundaries of traditional conservation. Gates clearly is uneasy about tinkering with nature in this way. But traditional conservation techniques, such as setting aside reserves, can't combat climate change. "Let's face it," she said, climate change will "push species to extinction if we do nothing. I can't stand by and let my system die before my very eyes." Coral reefs have suffered overfishing and pollution for as long as numbers of people have lived near them. Now coral also confronts a steadily rising concentration of carbon dioxide in the air, which increases the acidity and temperature of ocean water and raises sea level. It's an unprecedented combination of adverse conditions. In the past year, the confluence of long-term warming and a strong El Niño have endangered reefs around the world. The National Oceanic and Atmospheric Administration (NOAA) recently reported serious coral die-offs in waters near dozens of countries and archipelagos. Australian scientists have pronounced dead 35 percent of corals on the northern and central sections of the Great Barrier Reef. Gates' team, in collaboration with a group under Madeleine van Oppen, a senior research scientist at the Australian Tropical Marine Research Agency, is breeding more resilient coral strains. They're also testing treatments—such as short blasts of heat—that might toughen up corals and their progeny. In 2015, the two scientists received a $4 million grant for their work from Paul G. Allen, a co-founder of Microsoft. If the research turns out, whole reefs some day might be populated by organisms bred in her labs, Gates says. Radiators might even apply heat therapy to mile-long stretches of coastal waters. Gates directs a 25-acre campus on Coconut Island, a verdant reserve, once a playground for the rich and a backdrop that appeared in opening scenes of the TV show "Gilligan's Island." In May, I took a power boat the few hundred yards from the mainland. Gates met me brandishing a key ring. We hopped into a beat-up golf cart and soon pulled up to a dozen fiberglass tanks clustered together like hot tubs in a showroom. She walked onto a wooden deck from which researchers inspect experiments conducted inside. Seawater from offshore is heated and circulated through the tanks. Chunks of coral cut from local reefs soak inside, like pampered spa guests. Just as pigeon fanciers create superior birds for homing and tumbling, Gates hopes to develop climate-proof corals. On that day, she was testing three different experimental treatments, each replicated in four separate tanks. After three to six months of conditioning in their warm baths, the corals will grow up in nurseries nearby. Gates says she hopes some of the treated specimens will resist heat and acidity better than untreated varieties. The experiments could show which treatment works best. Gates also seeks out naturally-hardy corals. Divers off Coconut Island search for the rugged corals of each of the five major species that grow there. Gates breeds the best corals found offshore or created by conditioning, to enhance their heat and acid tolerance. If she can create such organisms for the reefs off Coconut Island, she says, other researchers could do the same thing for threatened reefs all around the world. But producing super coral differs from traditional breeding in at least one important regard: Coral relies intimately for its survival on a second class of organism. Corals are soft sack-like polyps that, depending on species, either live alone or in dense colonies, some of which produce reefs cemented together with their own secretions. Vase-shaped polyps feed in part on small prey captured in stinging tentacles that ring their mouths. But the polyps can't survive solely on food they can ensnare. There aren't enough victuals in the nutrient-poor waters where they grow. They require additional energy. Nature has supplied it by arranging a remarkable partnership between the polyps and the algae Symbiodinium, which lives inside polyp cells. The symbiotic algae serve the polyps sugars and other nutritive compounds made by photosynthesis. The coral, in turn, offer the algae physical protection and scarce nutrients such as sulfur. The prismatic displays corals exhibit are created not by their own tissue but by Symbiodinium's photosynthetic pigments showing through coral's transparent cell walls. But Symbiodinium depart coral cells if they get uncomfortable. When ocean water gets too hot, they flee like residents of a house on fire. Absent their symbiotic guests, coral turns bone white—giving the disorder caused by the loss of the algae its name, bleaching—and, in time, dies of starvation. NOAA reports that warm water this year has bleached coral in more reefs than in any known previous event. Gates says corals might resist warming better if they host heat-tolerant strains of Symbiodinium. But she says the problem isn't simply identifying or creating, better algae varieties. Corals must be coaxed into cooperating because they're very choosy about partners, especially once they're full grown. Gates is seeking "entrepreneurial" corals willing to host heat-tolerant algae. Alternatively, she says that some manipulation of corals, such as "a slight temperature modification to the little beasties," might induce them to accept algae they would otherwise reject. The fictional dinosaur cloning in Jurassic Park simultaneously fascinates and horrifies visitors to the movie's research site, Isla Nublar. Similarly, coral scientists are excited and unsettled by Gates' Coconut Island research. Robert Richmond, director of Hawaii's Kewalo Marine Laboratory and a past president of the International Society for Reef Studies, calls the Coconut Island research "innovative and important." In a conversation by Skype, Richmond said that now that scientists have documented threats to coral, they should seek out solutions. To do otherwise, he said, would be akin to a doctor's telling a patient, "You have liver cancer or kidney cancer and saying 'Have a nice day.'" Yet he fears adverse consequences of replacing the genetically diverse coral communities with less diverse laboratory varieties. Corals are among the most prominent species suffering widely from warming, but they are hardly the only ones. Biologist Thomas Lovejoy, a senior fellow at the United Nations Foundation, said by e-mail that in coming years global warming will raise ethical and logistical challenges for conservation around the world, on land as well as in the ocean. Moving species—either naturally occurring or improved strains—into habitats where they never lived before could become an important conservation tool, he wrote, "but should be approached cautiously." A stark delicate branching coral stands upright on a pedestal in Ruth Gates' office, like a bonsai sculpted of ivory. It's a stark reminder of the stakes in her quest. "Can we prevent the catastrophic loss of three-quarters of the world's reefs?" she asks rhetorically. "I don't know." Those committed to preserving the world's coral reefs—for economic reasons such as subsistence fishing, for vacation viewing or simply because these habitats are wonders of nature—eagerly await an answer. The author's travel to Hawaii was supported by Abby Rockefeller and Lee Halprin, in collaboration with the Pulitzer Center on Crisis Reporting. Will the Arctic Be Ice-Free Within the Next Two Decades? When sea ice melts, the ocean loses its reflective surface and the dark water absorbs more heat. “The Arctic is a region that's probably seen some of the most dramatic changes over the past few decades. And I think possibly one of the most iconic images is the decline in the Arctic sea ice." That's Kristina Pistone of the National Aeronautics and Space Administration's Ames Research Center. She said melting Arctic sea ice is not only a symptom of global warming, it's also an important contributor because of the “albedo effect." “Albedo is basically the whiteness of something. So if you think about sea ice, it's very white, it's very bright and very reflective. It will reflect a lot of the sunlight that hits it back to space. And you can compare this to the ocean surface, which is a very dark surface, it absorbs a lot of the heat that hits it," she said. So when Arctic sea ice melts, the underlying ocean water absorbs more of the sun's energy and heats up. That, in turn, melts more sea ice. Since 1979, more than 600,000 square miles of winter sea ice has disappeared—an area more than twice as big as Texas. Pistone said that rate of loss could lead to ice-free summers in the Arctic within the next two decades. Which would be tragic for local ecosystems, accelerate global warming and affect weather patterns worldwide.